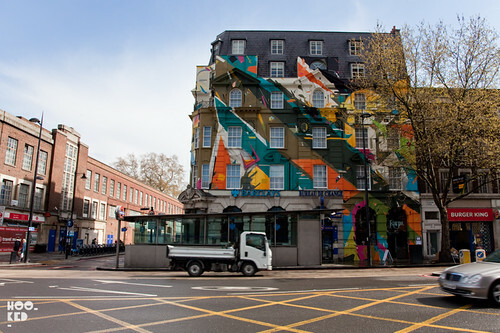 Earlier last month saw the completetion of this impressive and eye catching project by the Agents Of Change for the Megaro Hotel and Karpo restaurant. 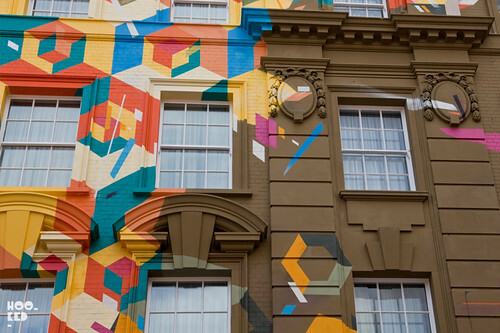 What looks to be one of London's largest street art / graffiti murals has been painted by the four members of Agents of Change – Remi/Rough, Steve More, LX.One and Augustine Kofie with assistance from David Shillinglaw. 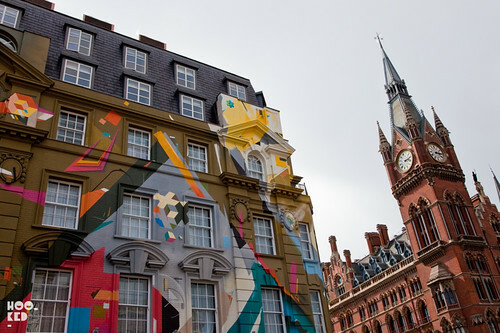 The project encompasses the two sides of a five storey Georgian building located directly opposite St. Pancras International Station in Kings Cross, London. 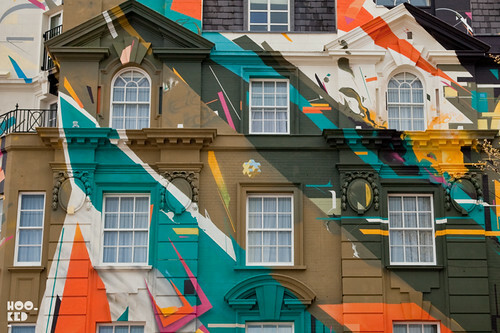 With the building wrapped in scaffolding, it took the artists two whole weeks to complete, using over 150 litres of emulsion and 160 litres of spray paint. On it's unveiling, the buildings colourful new addition was very well received although it was met with some opposition from a member of the King’s Cross Conservation Area Advisory Committee who felt "what was an attractive building had now been knackered with a layer of permanent paint,like an unwanted tattoo"! We personally feel it is a great addition to the city and especially the Kings Cross area. And what with London hosting the 2012 Olympics this summer it makes for a fantastic first impression on national and international visitor arriving into St. Pancras, highlighting London as a vibrant and creative city. What do you think? If you have not been in person we suggest checking it in person and also be sure and have a look at this time-lapse film below of the murals creation.